How do you sleep when the nights are lit? 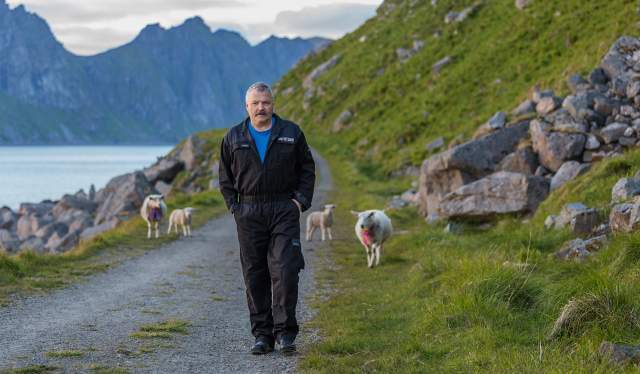 For the farmer Ivar Andersen from Northern Norway, it’s easy: he doesn't. It’s the middle of the night, and Ivar Andersen is counting sheep. Literally. He’s not lying in bed, twitching and turning, waiting to fall asleep. He is actually pointing at a group of bleating lambs, grassing at the steep, green mountainside in front of us. 180 lambs and sheep, located 68 degrees north, to be more specific. “How can I sleep? I work 25 hours a day”, the sheep farmer from Norther Norway says, and laughs. At Uttakleiv, on the northern side of the Lofoten archipelago, the days never end. During the summer months, the nights are lit by the midnight sun. They can be golden and sun-filled, as though it’s broad daylight. Or, like a prolonged sunset, the sky can bathe in a reddish glow. As the clock strikes twelve on this particular night in late June, beams of light suddenly sneak through the veil of clouds. They shine over lambs and landscape with a bright, but gentle light. Since there’s no actual nighttime here, “you just have to decide when you want to go to bed”, Ivar says while walking amongst a group of bouncing lambs. As their owner, the lambs seem to have a special form of nightly energy, rare to find even in the hottest of night clubs. Ivar Andersen is the 14th generation of farmers at Uttakleiv. Proudly, he’s one of few northern farmers who deliver Lambs from Lofoten, known as one of Norway’s finest food treasures, protected by trade mark. What makes the Lamb from Lofoten so special? The answer is in the soil, which is particularly luxuriant. The coastal lambs eat nutritious grass and herbs, which are infused with salt, carried by wind from the sea. In other words, the meat is salted by nature. “Grazing, trampling and fertilisation from the animals actually improve the qualities of the pasture. There’s an interaction here between the plants and animals, which makes the conditions unique”. 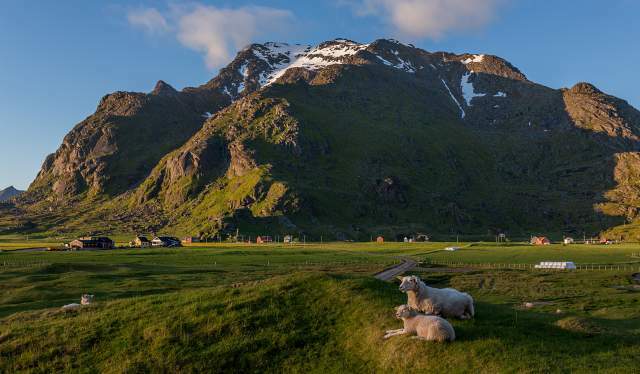 In addition, Ivar’s lambs and sheep are free to climb, walk and graze all around the green hillsides of Lofoten. “There are no fences here”, the farmer says. Fenceless and free. The land of the midnight sun is a place to find solace. At least that’s the case for the acclaimed New York-writer Rebecca Dinerstein. Spending two years in Lofoten, she fell so in love with the arctic way of life that she wrote two books about it. In her novel The sunlit night, she explores the seductive scenery of the northern summer with a luminous love story. Not strange, considering that Lofoten houses Europe's most romantic beach, according to the British newspaper The Times. With its rocky shoreline, white, sandy middle and turquoise water – a hidden gem – Uttakleiv Beach is as made for a private picnic, or a proposal. Maybe even a moonlight swim in the midnight sun, if you don't mind the temperature. If you visit the small coastal village, you may find that there’s not only sheep living in the hillsides. “Once, we had a tourist camping in the mountains”, Ivar tells. “He was alright, and we figured he might be staying up there for a day or two. But weeks later, his tent and bike were still there, yet we saw nothing of him. After a month, my neighbours and I got really worried, so we went up to look for life”, he continues. “But when we got up there… all was perfectly well”.